During my visit to Croatia, I had the lovely experience of visiting Grožnjan, known as the “Town of Artists”. Grožnjan (pronounced roughly “Grosh-nyan”) is situated in an area called Istra. Driving through Istra reminded me of road trips through New Hampshire or Vermont. Huge areas of land are completely covered by forest; other areas contain small family-owned farms where sheep are found sleeping in the shade under olive trees. Road side produce stands are sprinkled here and there, selling vegetables, cheese, honey and olive oil. 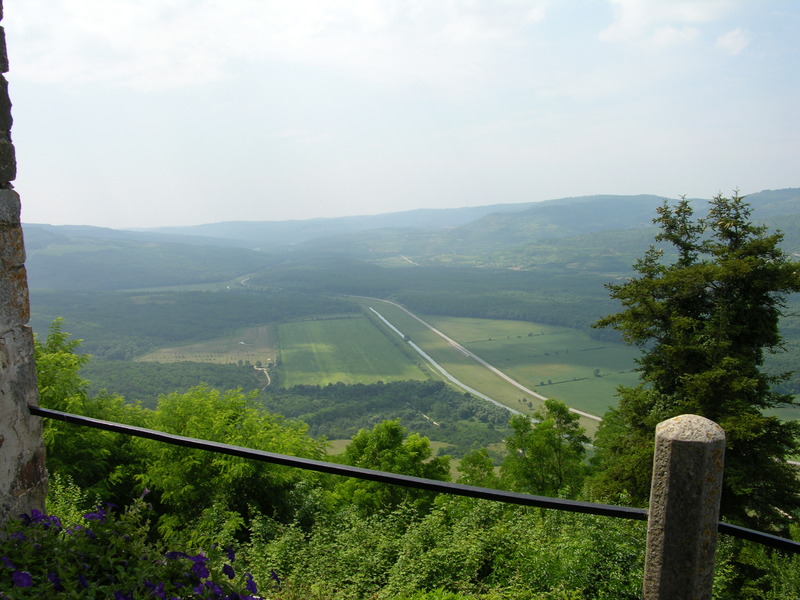 And way up on a hill is an ancient stronghold town made of stone and clay buildings, overlooking this pristine landscape. My father in law, born in Croatia during World War II, told me the story of Istra and how the town of Grožnjan owes its vitality to artists. 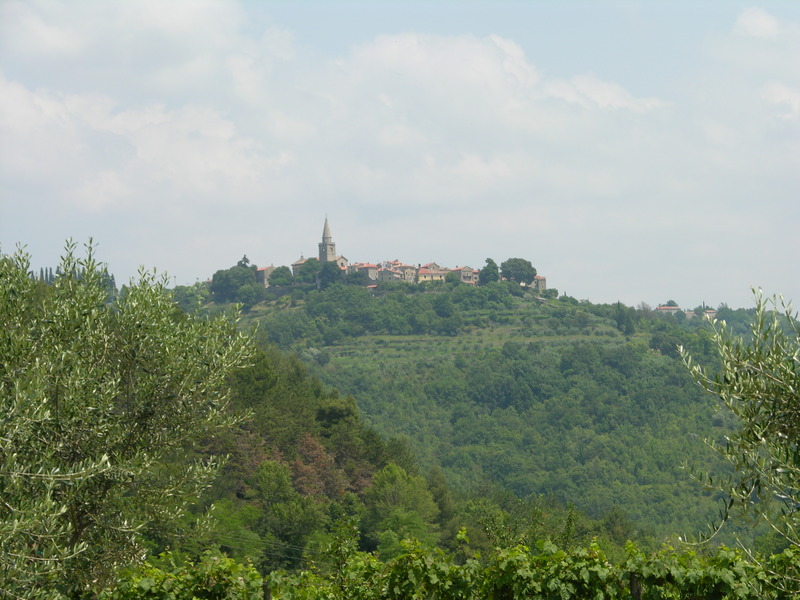 Grožnjan was once part of Italy, owned by the Venetian republic for most of its 800 year history. Its inhabitants were almost wiped out by plague in 1630, but was revitalized when Venetian tradesman and artisans settled there and began to maintain and improve the town. After World War II, Italy’s borders were redrawn making Istra part of Yugoslavia (now Croatia). For the second time, the town of Grožnjan was nearly wiped out. As the Italian residents moved out, the town was nearly desserted. With so many homes left abandoned, local Croatian artists began using the empty buildings for studio space. Istra was relatively secluded at the time; the few remaining residents were primarily farmers. 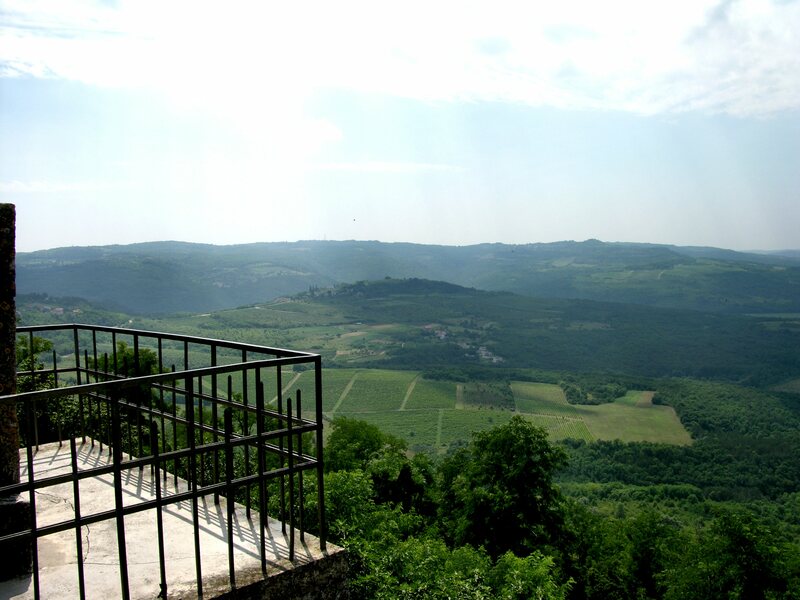 Grožnjan was particularly attractive to artists because of its location overlooking the inspiring and beautiful landscape and because of the availability of nice, quiet, and most importantly free living/working space. 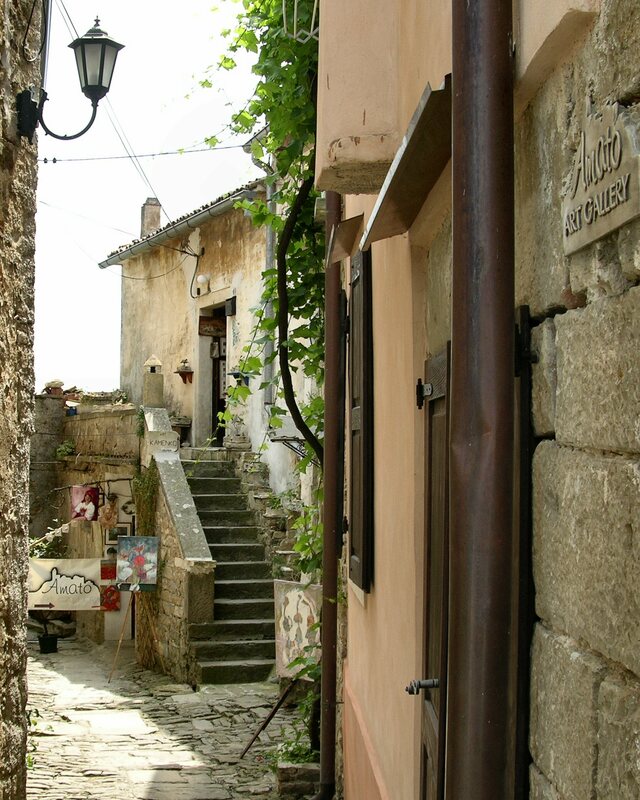 The area of Istra became a magnet for painters, sculptors, musicians and dancers. Soon Grožnjan was “taken over” by artists who became very protective of the town’s integrity, its aesthetic appearance and its environment. 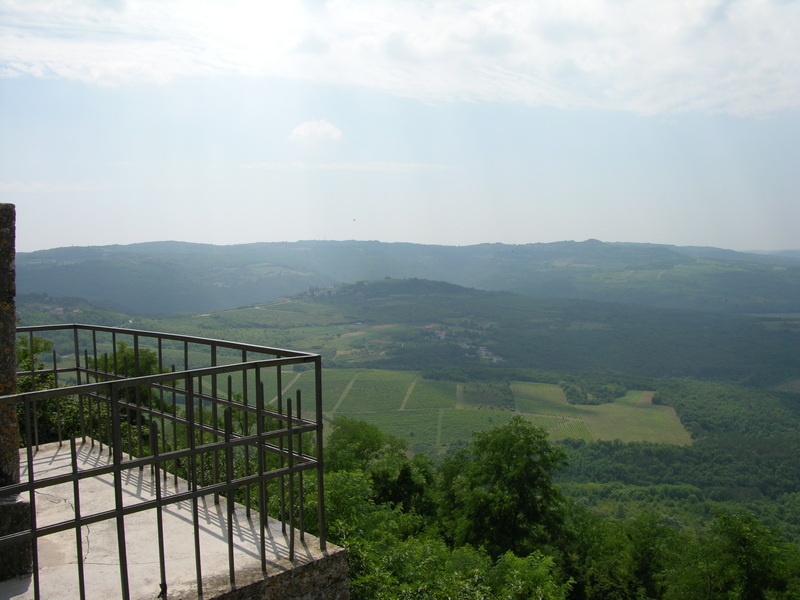 Istra’s economy is still primarily agricultural, so the landscape has remained pretty much unchanged. Residents of Grožnjan have also made sure to preserve the town’s historical identity and appearance. Other than electrical wires which cannot be hidden, there are really no outward signs of modern technology visible in the town. You will not see air conditioners hanging out of windows, satellite dishes on rooftops, neon signs or traffic lights anywhere in Grožnjan. This is because the residents have passed ordinances banning these things. Once again this is a prosperous town, drawing tourists and visitors as well as being the permanent home of many artists and musicians. The International Cultural Center for Young Musicians has a base here and the Academy of Dramatic Arts, University of Zagreb has established summer programs in Grožnjan. I love the fact that this town is occupied and governed almost entirely by artists. I love that they make laws to protect the town’s aesthetic… who else would do that? Mostly I love the community that embraces all forms of art – from fine art/visual arts to music to performance art. Street signs are hand painted ceramic instead of the usual printed metal. Carved stone benches are everywhere, just so you can sit and take in the view. Film festivals, ballet recitals and concerts provide a constant rythm like the town’s heartbeat. Walking through the streets, you may pass a ceramics studio, a printshop, a music school and a theater; then stop for coffee and chat with local artists or tourists. When you’ve finished your espresso and possibly a little ice cream (Don’t worry, the climb up and down the main road will burn off most of those calories! ), you may want to see a bead-making demonstration, check the schedules for the next jazz festival or yoga class, and maybe even purchase a unique piece of art before heading back home. Our family travels to Croatia every other summer, and each time I try to visit at least one or two places I haven’t seen before. But sometimes I find a place that I want to visit again and again. Guess where I’ll be headed next time? I visit here to see the art and the craft – it is truly beautiful. I love the photographic galleries and can spend hours looking at the scenes. A must for everyone to visit. My ex-father-in-law is from this town and it is indeed beautiful. For other gorgeous towns, though on the Adriatic, go to Rovinj and Pula. And for Peter, yes, my ex-husband’s first language was Italian and he learned Serbo-Croatian in school. I enjoyed your article. I live in Istria and spend a lot of time in Grosnjan. I would point out a gap in your historical comment. Istria was briefly occupied by Italy between the two world wars. It was never part of modern Italy. It was last previously associated with Italy 200 years ago, when Italy was not even unified. If you are to include anything that belonged to the Venetian Empire you’d have to include Crete and Cyprus and no-one ever does, so why Istria? For the last few hundred years Istria always had a majority Slav population and the only reason a lot of the Italian minority left in 1945 was because a minority of the Italian occupation regime had behaved badly against the slav majority and their forced Italianisation had resulted in residual antipathies. You are not alone. American websites routinely push the myth that Istria was somehow stolen from Italy. Not all the Italian minority left. Many still remain and Italian and Croatian languages have parity in Istria. Most Istrians are bilingual. When their grandparents went to school, the use of Croatian was forbidden and they all grew up having been forced to be taught in Italian. I have been fascinated by the Adriatic Coast and Croatia since I read Rebecca West’s “Black Lamb and Grey Falcon” ( http://www.theatlantic.com/unbound/flashbks/west/west1.htm ) When I read the opening chapter of that book again, I am surprised at how unlikeable the book and its contents seem to be — and yet the author’s account of her trip through the Balkans, regardless of the historical and present violence (she is traveling in 1936) she recalls, enthralled me. Your description of this village makes me understand more fully why. Thanks for the information. I wonder if there are any other such villages in the world, under artistic rather than political control. And how the “politics” work themselves out among the artists there. Thanks for sharing the story and pictures of this town – like a fairy tale! Since the artists took over the town after WWII, and are still the primary occupants, it must be that they can make a living at this. Their lives must be bliss to live and work in such a place. Oh, I wish i wasn’t leaving Europe in 8 days. We never got around to taking our Croatian coast summer vacation, and now this makes me regret that even more. What a beautiful and inspiring looking town.